Why Is Your Reflection Sometimes Upside-Down When You See It On A Car? 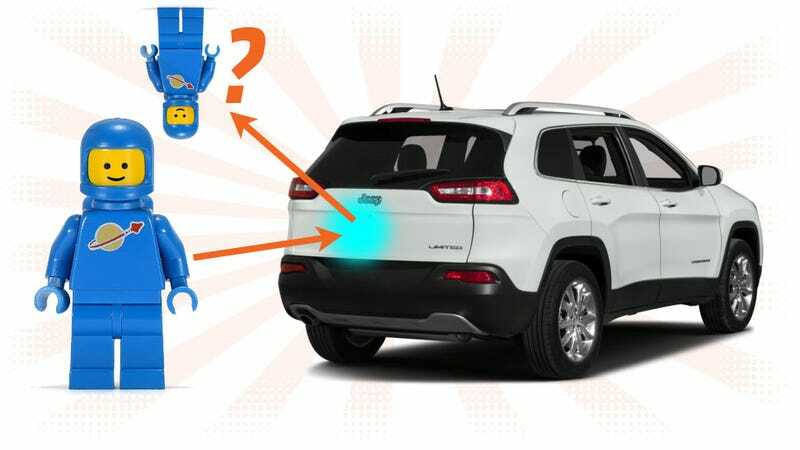 Earlier today, we got a simple but interesting question emailed to us from a guy named Rich: “Anyone ever notice that on the new Jeep Cherokees, the reflection that you see on the back panel is upside down? This is the only car that I’ve ever noticed this phenomenon. What makes this so?” Best question from a guy named Rich I got all day. Let’s see what’s up. There’s the hatch of a Jeep Cherokee (incidentally, it’s for sale here, if you want to confirm this at home and get a usable car in the deal, too) and yep, there’s the photographer reflected in the tailgate, seemingly defying gravity. Actually, if we look closer, we can see that there’s actually two reflections going on here: one very squashed upper one with the proper vertical orientation, and the larger, lower one that’s flipped the vertical axis of the image. So why is this happening? Is this something Jeep planned? Is this a thing? First, it’s probably not a thing, and it’s unlikely Jeep went out of their way to plan this, unless there’s some focus group studies about vertically-inverted images increasing perceptions of status and quality I haven’t heard of. What’s going on here is that first, the Jeep’s tailgate is covered in a glossy reflective paint that bounces rays of light back, like a mirror. This is basic, and something we all know about any shiny surface. See how there’s two main curves going on here? smaller top curve that bows out, and a larger curve that goes into the body of the tailgate. Essentially, what these shapes are producing on the Jeep’s tailgate are a pair of stacked mirrors, a convex one over a concave one. For simplicity’s sake, let’s assume the tailgate is only curved in cross-section, and ignore the slight secondary side-to-side curve of the tailgate, giving the tailgate a cross-section sort of like a pair of halved and stacked cylinders. The upper “mirror” is a narrow convex mirror, which provides a smaller, upright reflected image. Rays of light striking the mirror parallel to the mirror’s axis will appear to come from the focal point of the mirror, which, in the case of convex mirrors, is behind the surface of the mirror. The result is a small image, and, in this case, squashed-looking because the mirror ‘cylinder’ is so small. The one that our man Rich was asking about, the one that makes an inverted image, is the lower, concave mirror. Concave mirrors are sort of like parabolic dishes, in that the parallel light rays bounce off the curved-in surface and bounce to the focal point, which you can picture as being where the center pole-thing on a satellite dish would be, in front of the mirror surface. In the bouncing-off process, the light rays that hit the bottom bounce up to the top, and vice versa, creating an inverted image. So that’s why when you look into the rear hatch of a 2016 Jeep Cherokee (there’s other examples, of course, but I’m sticking to our sample) the person looking back at you will be upside-down. Also, they’re evil and you’re good. If you get close enough, the image should revert to the proper orientation, so feel free to try that experiment out, too.